The Kaniram Narsingdas Tibrewal Haveli was build in 1883 by one of the most wealthy merchant of Jhunjhunu town know as Narsingdas Tibrewal. 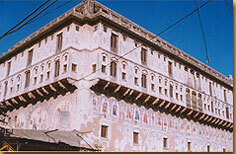 The Tibrewals were quite prosperous and famous businessman of Jhunjhunu. All these Havelis were mainly constructed in the latter half of the 19th century by the wealthy Marwari merchants of Shekhawati region. Trade was their main reason for venturing out of their own town. They mostly traded in Calcutta and the north east regions. Kaniram Narsingdas Tibrewal haveli is a perfect example of intricate craftsmanship of artists and wealth on part of the owner.